Sunday morning, Kibber, a small village at 4300m in the Buddhist Himalayan region of Spiti, northern India, near the Tibetan border. 11.30, the rain has stopped though our Tibetan host says it never rains. Low clouds cover the mountains above the village. Slow breakfast on the balcony - porridge, fried aggs and toasted bread. Kids playing handball in the schoolyard. A line of trekkers is straggling in over a low hill behind the village, coming from Ladakh via the Parang La. Tired and dirty – the last three days are tough – but in good spirits, a mixture of French and Canadian men and women. They’re the reason we can’t stay here a second night – they’ve booked all the rooms. Young children play in the bare fields above the village. By the late morning older children are out of school and walking between the houses, inevitably they pose for photos. We want to find the local schoolteacher we met three years ago – we’ve brought photos of his young twins. 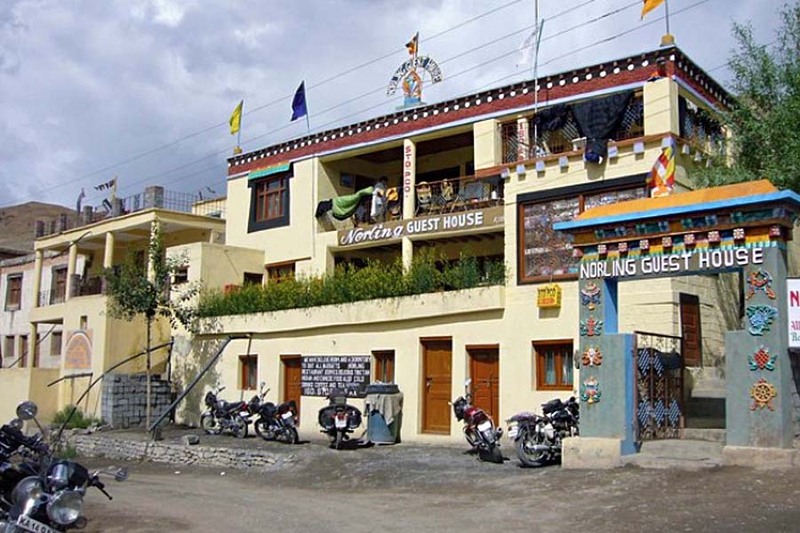 Our Tibetan friend tells us that he lives in a house with blue windows. All the houses in the village have blue windows. 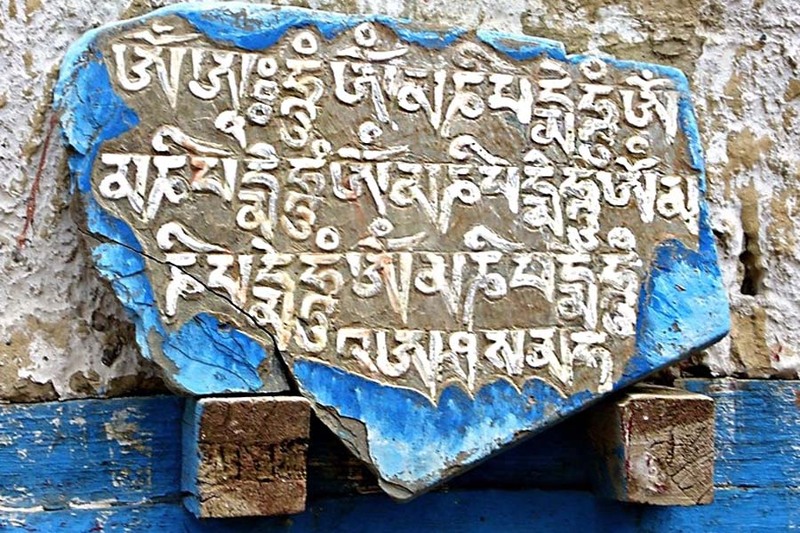 Blue and white are the colours of Kibber, even the mani stones with the Buddhist mantra Om Mani Padme Hum, are painted blue. We wander round the village and eventually get guided to the correct house. His teenage daughters open the door, let us in and make tea while we sit on the floor in the best room. He gets called over from a village meeting and seems pleased to see us but I suspect they get several visitors and he should be at the meeting. 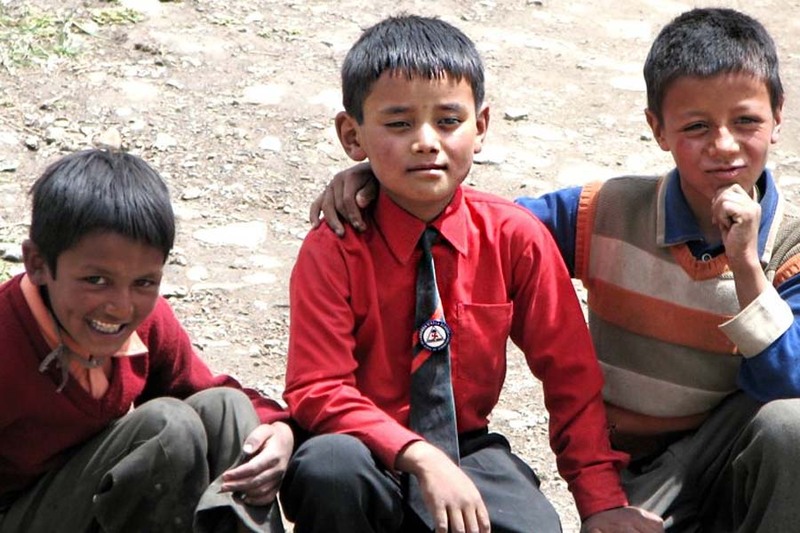 His clothes look even more worn than last time and we gather that he has to travel each day to another village to teach. Some would see it as a hardship posting but this is where he was born. The family look at the photos and show us the same ones on the wall, the ones we posted three years ago, not knowing if they’d arrive. The twins are now six, what we thought were two boys are in fact a boy and a girl. We don’t see the girl who maybe isn’t well. 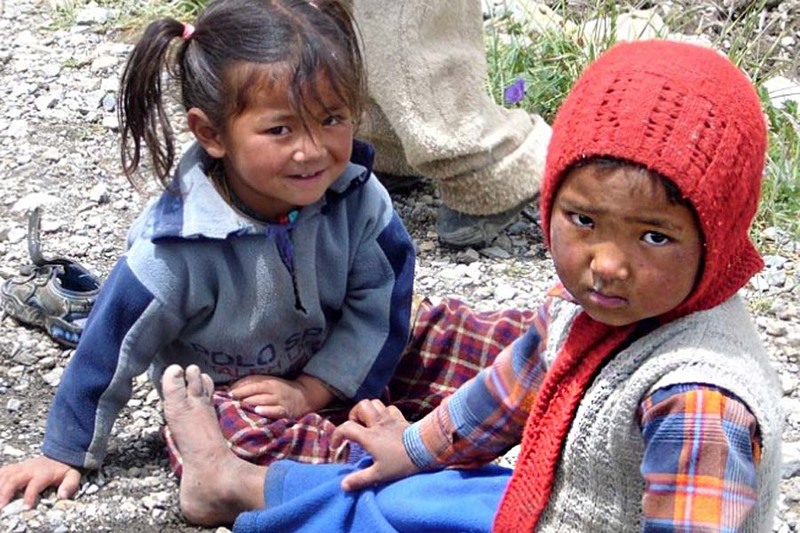 One of his older daughters has finished school, the other is in her final year and wants to be a doctor but seems to lack the confidence to go to the college in Chandigarh, preferring the less ambitious challenge of Dharamsala, which would be less of a culture shock. Their brother speaks better English but prefers to watch TV. We leave Kibber and walk down the road to Ki. The road is a biscuit coloured track carved into the steep hillside, just wide enough for two cars, if the drivers have the nerve. Rocks the size of buses perch on the slopes over our heads; the road is covered in the smaller stones that constantly roll down the hill. A thin path zigzags down from the track to a stone building by a curve in the stream far below, curiously built with a pitched roof. A long cable stretches across the valley, hundreds of feet above the stream. The cable runs over pulley wheels and suspends a square wooden crate, smaller than a pram - a flying fox is the quickest way to cross the valley. A man wearing a Honda motorcycle t-shirt passes us shouting Julee, the local greeting. 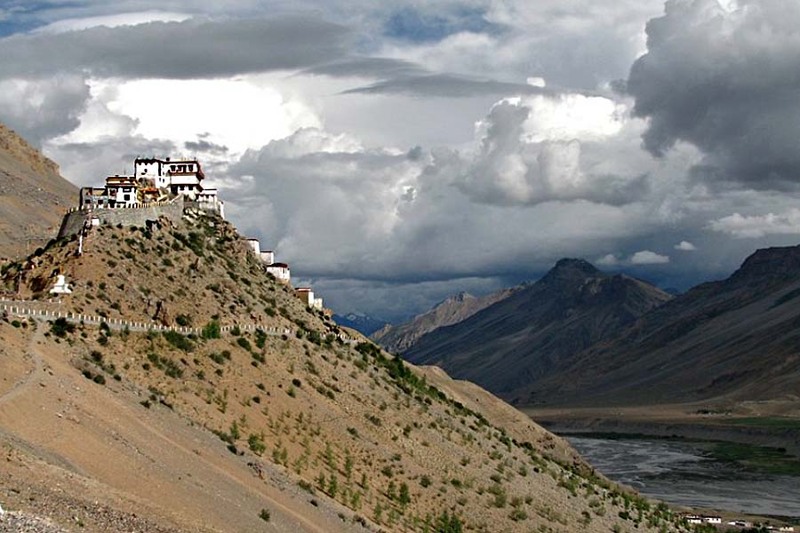 Up ahead, the glistening Spiti River finds a dozen slow routes through a wide flood plain. 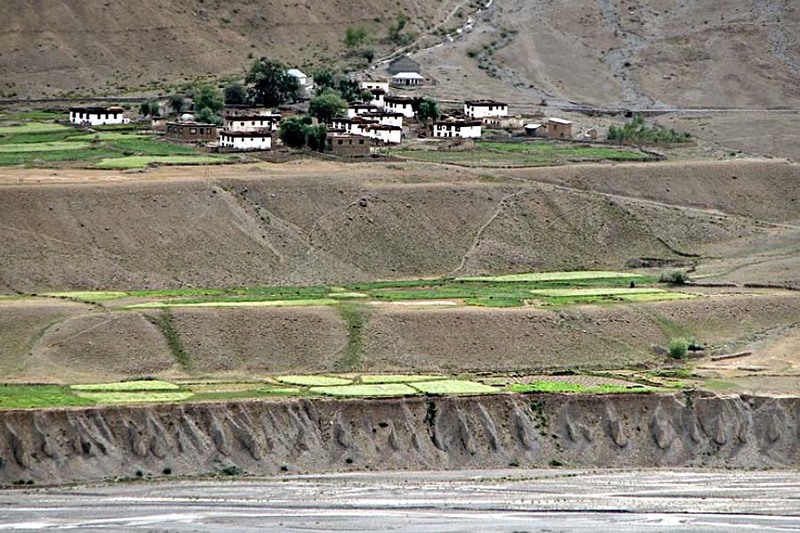 A hundred feet of vertical fluted erosion separates the river from the green terraced fields and villages on the far side. 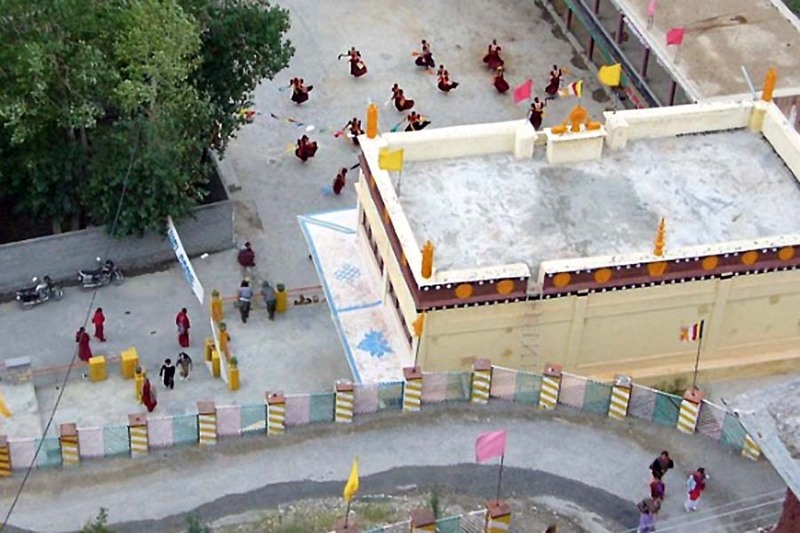 The road flattens before the gateway to the Buddhist monastery of Ki; a tall, brightly painted square concrete arch spans the road and the beginning of a steep climb up to the monastery. Ki is perched on top of conical hill. We’ve arrived the day before the main festival and in time to see the dress rehearsal in a large courtyard below the main buildings. Tomorrow will be more dramatic but today is a privilege because very few people are here and the monks dancing in the courtyard aren’t wearing their masks - so we can see their expressions. No masks or brocade costumes but they are wearing their beautiful traditional boots of embroidered felted grey yak wool with turned up toes. 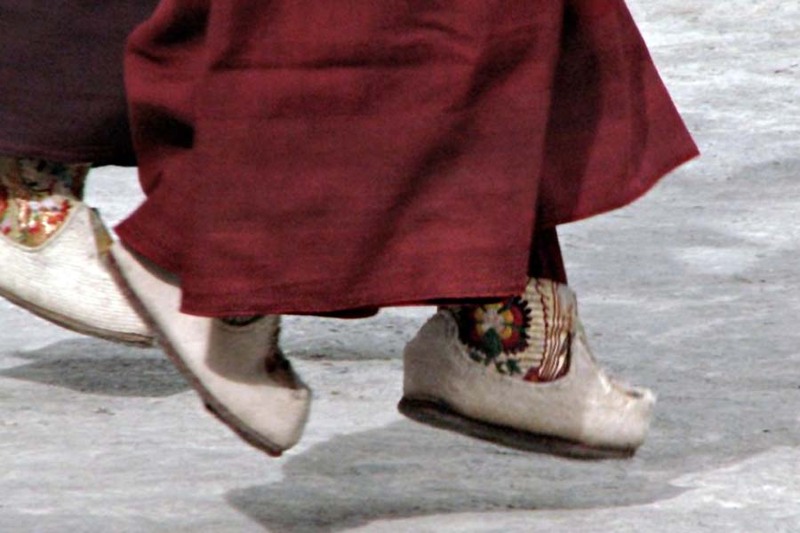 Himalayan dances start slowly with restrained foot movements that conserve the oxygen before progressing to a controlled circular hopping and frenzied whirling in time with the clashing of cymbals and blowing of long Tibetan trumpets called Dungchen and conch shells. 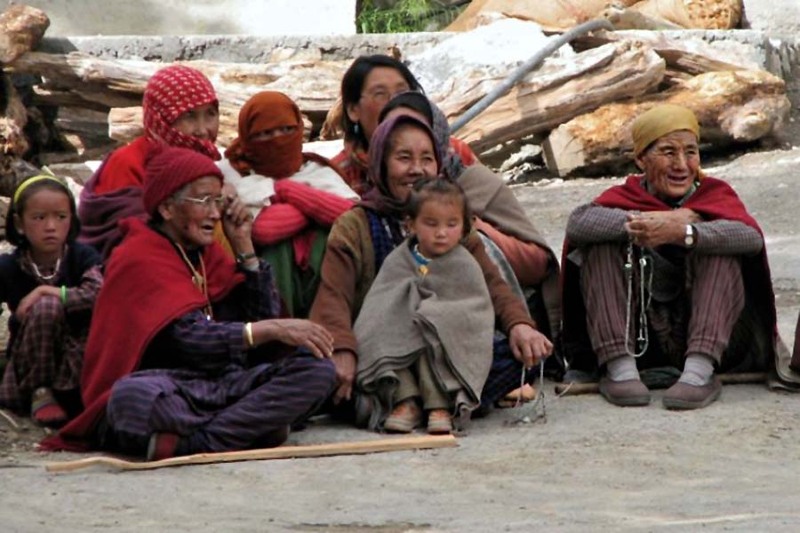 Local families sit on the ground, watching. 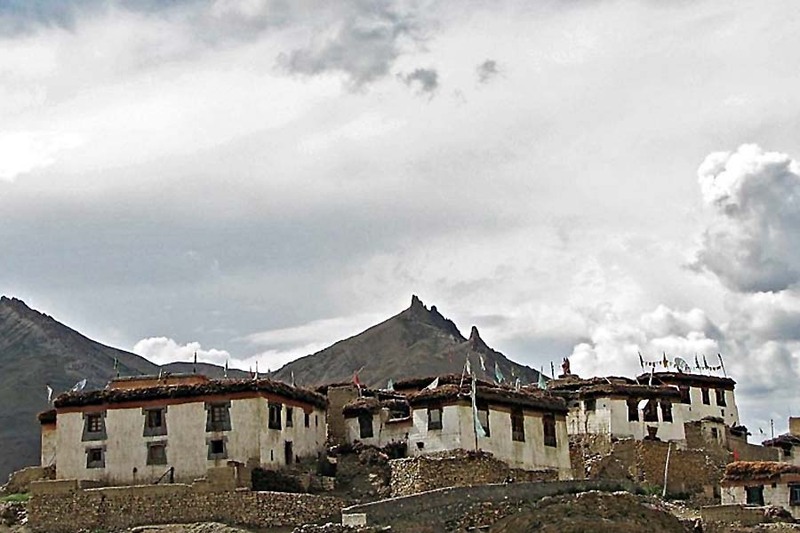 In a gap between the buildings in a corner of the courtyard we can see the mountains girding the Spiti valley. We’re shown around the monastery by an old monk – the same one we met three years ago. One of his tasks is to replenish the offering bowls of water every day; it’s been his job for the last 20 of his 42 years. Ki is about 1000 years old and we’re shown through rooms of varying antiquity. The large prayer room with a prominent photo of the Dalai Lama is well lit and newly painted, the silk brocades hanging down from the ceiling are new, the colours still bright. Tsongkapa is represented in several paintings and statues. In an older, darker room five large, powerful statues are dimly illuminated in glass cabinets. Back outside we can feel the air pressure change as the evening storm approaches, prayer flags are flapping in the wind. Standing on the roof we have immense views across the valley, sunlight streams through gaps in the cloud to illuminate black torrents of rain. Fat spots of rain are suddenly upon us and we shelter in a passage as monks come running up from the courtyard, soaked, carrying drums, bells and the long horns. 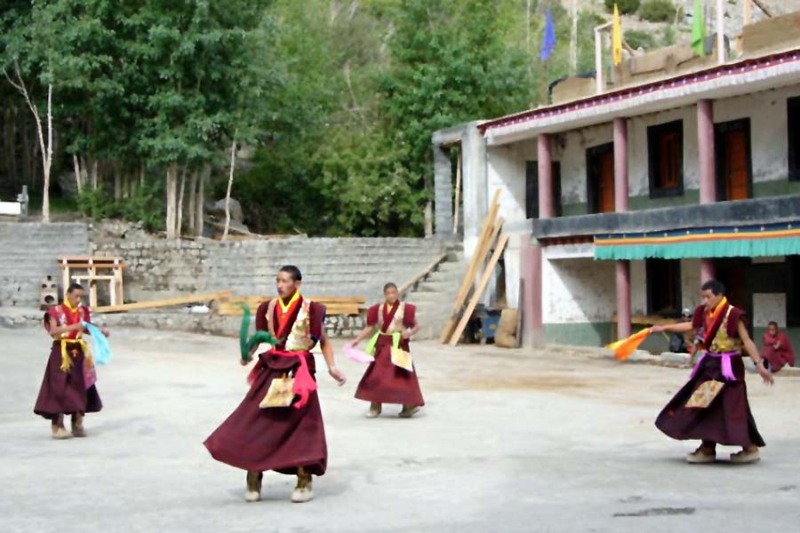 We drive down the valley to the Spiti Serai hotel. No electricity, but candlelight creates a better atmosphere for dinner. Several other people are eating here and the food is excellent.